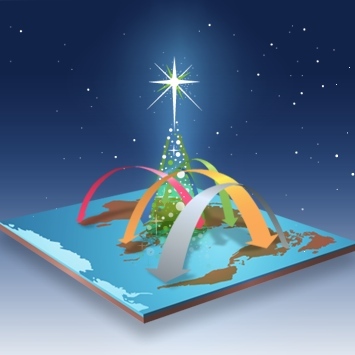 Looking for a great way to focus on the birth of Jesus? Try “The Christmas Story” Plan from YouVersion. This simple 5-day plan chronicles the humble beginnings of our Savior, connects us with His arrival as “God with us,” and ends with a celebration of His birth. Today is a great day to start reading “The Christmas Story”! Your kids will love exploring the story of Jesus’ birth in “The First Christmas Gift,” just one of the stories they’ll find in the Bible App for Kids. Installed on more than a million devices during just its first week, the Bible App for Kids draws in children of any age, with colorful artwork and fun, touch-activated animations. Download and share the Bible App for Kids now at bible.com/kids. 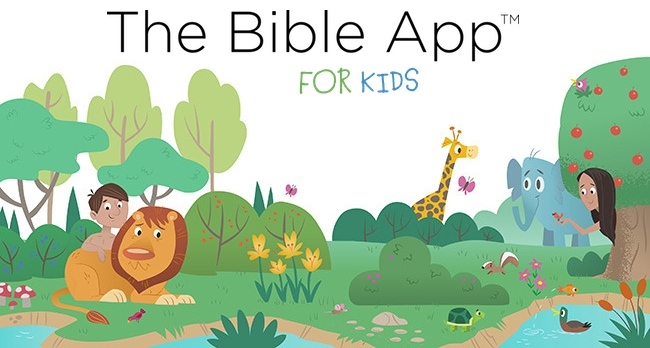 Part of the Bible App for Kids’ early success came from being visible in app stores. 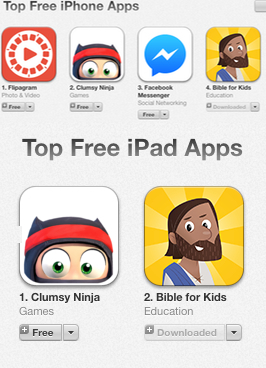 Over the weekend, the Bible App for Kids reached as high as the #2 overall free app for iPad, #3 overall free app for iPhone. 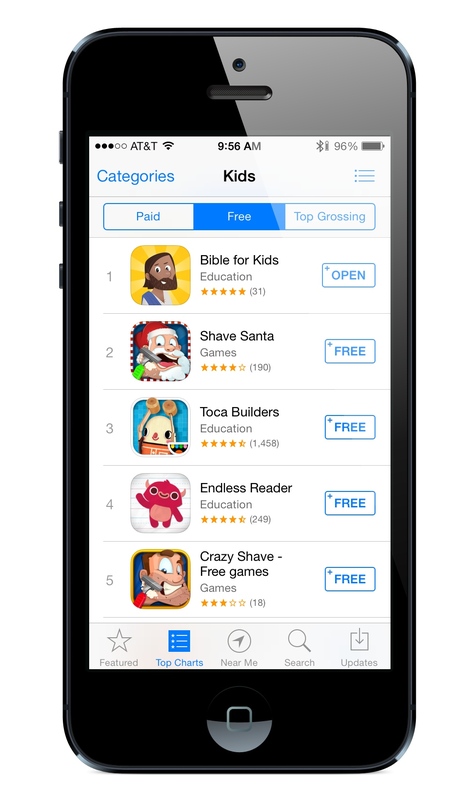 It was also the #1 free app in the Kids or Education category on iTunes, Google Play, and the Amazon App Store. Climbing so high on each of these lists means that potentially millions of people who otherwise wouldn’t even know it existed will now see the Bible App for Kids when they’re browsing for new apps to install. We specifically designed the Bible App for Kids to help children connect with Bible stories not just once, but again and again. And it’s our sincere prayer that exploring the Scriptures will help millions of kids discover a lifelong love for God’s Word. Throughout the holidays, as you find yourself together with family and friends, whether at home, at church programs, or even at work parties, please keep sharing the Bible App for Kids. You can show it to them on your device, direct them to bible.com/kids, or even offer to install it for them. During the Christmas season, so much can pull us away from the significance of what we’re celebrating—the gift of Immanuel, “God with us.” Advent, spanning the four weeks before Christmas, brings us the opportunity to redirect our focus. YouVersion offers several Bible Plans to help Jesus’ birth become a point of your daily reflection. And this year, we have more plans than ever before. Find the plan that’s just right for you—or try one with your family! You can find even more Christmas and Advent plans on YouVersion! Best of all, it’s quick and easy to help others get their own Bible App—no matter what kind of mobile device they have. Tell them they can just go to www.bible.com/app—or even better, install it for them! Even though the Bible App for Kids only launched yesterday, it’s already being enjoyed by hundreds of thousands of kids all over the world. On the first day alone, the Bible App for Kids was installed more than 450,000 times! That means the app was installed 5 times every second, all day long. Within the first 12 hours of launching, the app quickly gained momentum and garnered high rankings within the App Store. And there are currently more than one million different apps available in the App Store. Getting so much visibility early on means there is the potential for millions of iPhone and iPad users to discover the app that may have otherwise never even known it existed. Whether you’re a parent, grandparent, aunt, uncle, caregiver, or influencer, the Bible App for Kids is a fantastic way you can help the children in your life discover a Bible experience all their own. Designed specifically for children, we’re praying that the Bible App for Kids will help the next generation start engaging now with the grand story of God’s love for them. Thank you so much for your passion to share God’s Word with your kids! Even as incredible as yesterday was, we’re convinced that it’s only the beginning. God is doing something amazing. We always love hearing your stories on Facebook and Twitter. And don’t forget: millions of people haven’t even heard about the Bible App for Kids yet, so keep sharing it as much as you can. Tell people about it, show it to them on your device, even offer to install it for them! 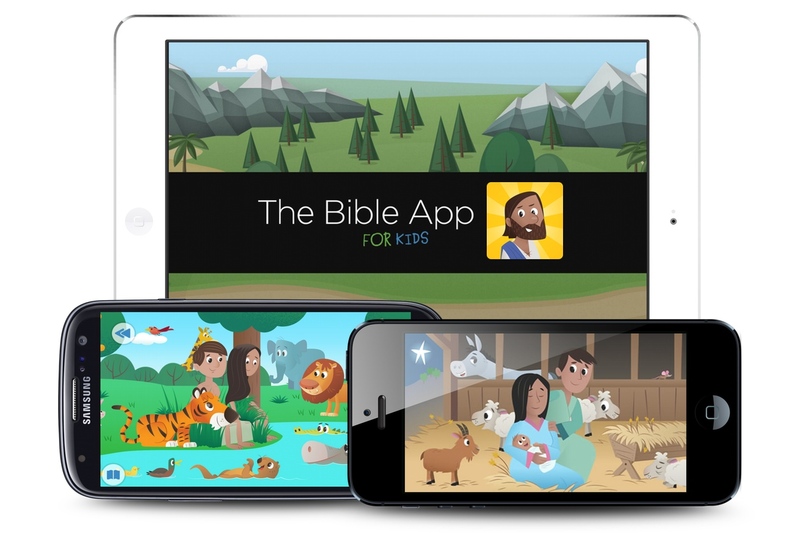 The Bible App for Kids is here!